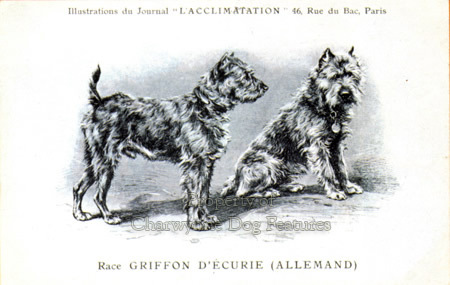 In Hutchinson's Dog Encyclopedia of 1934, it states, in its coverage of the breed: "The Schnauzer is in no way related to the Terrier group..." but only after stressing its capabilities as an all-round farm dog, especially in the ratting field. 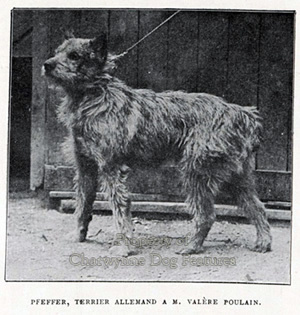 When working in Ireland it was always of interest to study the coarsely-bred but highly effective farm dogs there; so many of them, ungroomed and unclipped, resembled the Bouviers of Belgium, the Dutch Terrier or Smoushond and, in particular, the stable dogs of Germany, the Schnauzers. Going to work in Germany, immediately after working in Ireland, allowed me to keep a picture of Irish farm dogs in my mind when viewing their equivalents on mainland Europe. I have seen both Schnauzers and Wheaten Terriers being used as herding dogs in their native countries and appearing interchangeable in form and technique. Once, at a world dog show I was convinced that the light-fawn Bouvier des Flandres before me was a large Soft-coated Wheaten Terrier from Ireland. Size apart, the appearance, the coat, the personality and the attitude were easily confused. I see similarities too between old photos of the Kerry Blue, the Laekenois of Belgium and the Schnauzer of Germany; perhaps the farm function deciding form. When I was working in County Down some forty years ago, I used to see what could be called straw-coloured terriers on farms there, really like coarsely-bred Wheatens. These dogs were sheepdogs, ratters, beaters, retrievers and very sharp guard-dogs. 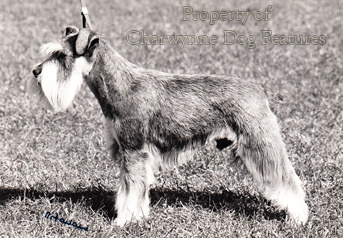 They lacked the long soft coat of the pedigree Soft-coated Wheatens of the show ring, but had the much stiffer, almost Schnauzer-like, straff jacket. Such a coat texture gives much more protection from undergrowth and the weather. The now extinct grizzle-coated Old Welsh Grey sheepdog had the look of an all-rounder and was often used with terriers. 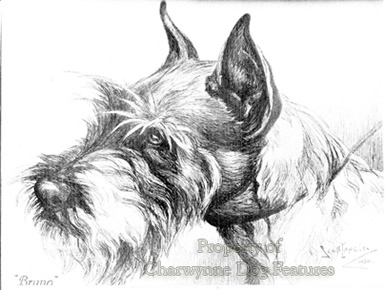 An all-round farm dog had to combine the duties of vermin-control and herding and, whatever the contributor to Hutchinson's Dog Encyclopedia opined, for me, the schnauzer and pinscher breeds are principally a form of terrier. Most of the terrier breeds are quintessentially British. But nowadays we can read of Rat Terriers as a breed in America, of the Brazilian Terrier and of the well-established Australian Terrier, as well as the misnamed Tibetan Terrier. French and German writers of previous centuries have made reference to dogs functioning as terriers, not just Dachshund types but Pinschers and Schnauzers too. We may have captured the terrier breed market but not the terrier function. The Dutch have re-created their Smoushond, with a distinct terrier appearance. The German Hunt Terrier has fanciers here; the newly-created Cesky Terrier has found favour here too. The Boston Terrier is not an earth-dog although it does have a bull terrier ingredient in its ancestry. 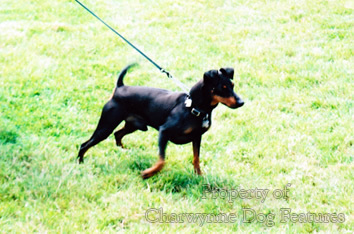 The Dobermann Pinscher and the Giant Schnauzer are, like the Airedale and the Russian Black Terrier, not exactly earth-dogs but the smaller pinschers and schnauzers were farm and stable vermin controllers, just like our native terriers. 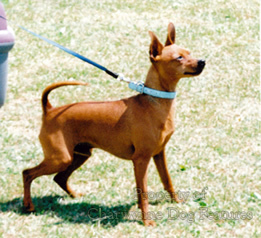 The smooth-haired Austrian Pinscher has many similarities with our emergent Plummer Terriers. The Franks had a small dog they called the bibarhund or biberhunt, literally beaver-dog. From these came a type referred to as rattlers, both smooth and rough haired. Later came the Rattinpintscher, literally a dog that nips rats, and in time the breed-type we know as the pinscher and schnauzer, literally a dog with a bearded muzzle, developed. 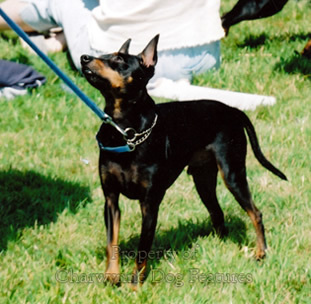 The German authority, Richard Strebel, writing in his massive work, Die Deutsche Hunde of 1903, recorded that: "There is little to say about the history of the German Pinscher. Illustrations of the breed are rare. It does not appear in old oil paintings. He occupied such a menial position, so unimportant, that artists felt it not worth their while to depict him for posterity." That statement echoes the omission of both pastoral dogs and terriers from English paintings of past centuries. 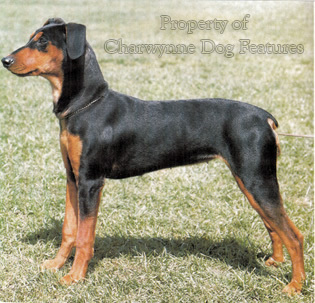 In some old English dictionaries, the word pinscher is defined as a dog breed, a short-haired English Terrier, black and tan terrier, rough or wire-haired terrier. 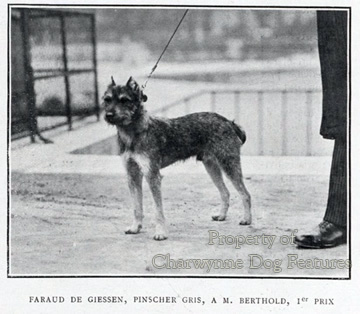 Some authorities state that the pinscher originated from stock brought back from England by German workers and that a cross with the French griffon-type produced the rough or wire-haired variety, to become known as the Schnauzer (originally the name for a 'snouted' or bearded pinscher). 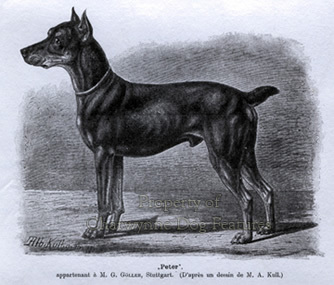 Interestingly, there is an old English print from the early 1800s depicting a notable bull-and-terrier of that time, with a definite continental look to it, called "Pinscher". In Ireland, the unusual smoke-grey coat of the Kerry Blue Terrier has been linked with the Harlequin Pinschers of the soldiers of the House of Hesse, who were stationed there. In Kay's Portraits From Nature (c.1810) there is an illustration from Scotland of a Pinscher; the coastal areas of the Scottish Highlands contained men who served as mercenaries in German armies. The Pinscher may have been imported by them. As far as the German Hunt Terrier is concerned, the reverse may have happened. 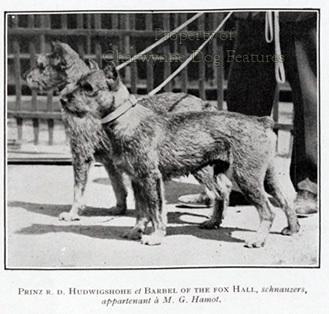 When I was working in Germany half a century ago, an old German Forstmeisster told me that his grandfather had imported English black and tan hunt terriers to control vermin. International boundaries have never been barriers to the dog trade. I have seen small black and tan terrier-types both in England and in Germany that could pass, in the smooth coat as either Manchester Terriers or Mittelpinschers and, in the rough coat, as Lakelands or (standard) Schnauzers. 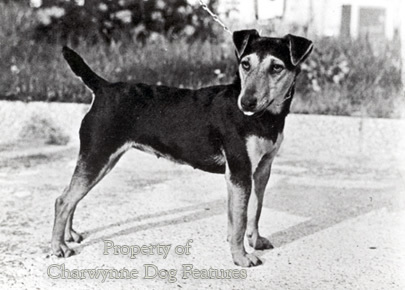 Old depictions of Schnauzers closely resemble early Norwich Terriers; many depictions of early Miniature Pinschers look very much like our Toy English Terrier (black and tan). I am aware of black Airedales in America that could pass as Giant Schnauzers - or Black Russian Terriers, for that matter. 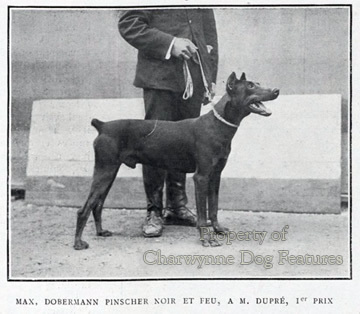 The Kennel Club recognises the Dobermann Pinscher (27" at the withers) as the Dobermann, the Mittelpinscher (18") as the German Pinscher, the Miniature Pinscher (12") as a Toy breed, and three varieties of the Schnauzer: the Giant (26"), the Schnauzer (called the 'standard' in the USA) (19") and the Miniature Schnauzer (14"). These varieties are placed in different groups and judged by people with different sets of knowledge; this is not good for dogs with a common origin. It would be of interest to see what effect their being judged by experienced terrier judges would have. The profuse heavily-feathered whiskers and leggings in the Schnauzer breeds would soon go if a working terrier judge had any effect! What we are truly seeing in these German breeds is the German Farm Terrier (rough- or smooth-haired and large, medium and small, in each of the two coats). 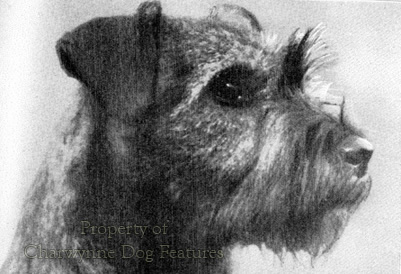 If they were then judged either as a terrier or as a pastoral breed, with varieties by coat or size, the foundling breed would be respected and breed-identity restored. Small ratting terriers are not Toy breeds; dogs that guarded stables and herded livestock are working dogs not ornaments. One day the KC will come to realise that how they classify breeds and how they group those breeds affects their whole future, their form especially. For me, if the Manchester Terrier and the Kerry Blue and Wheaten Terriers of Ireland are terrier breeds, then the German Pinschers and Schnauzers are terriers too. 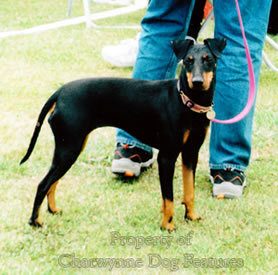 Oh, and the German for terrier is pinscher!